Household debt in Canada is now bordering on excessive, catalyzed by low rates setting off a boom of borrowing over the last decade. Canadians now collectively owe C$2.16 trillion, which as a share of GDP is the highest debt load in G-7 economies. At the same time, the housing market is starting to cool in the country and people are "freaking out", even with rates not far above historical lows, according to Bloomberg. The article profiled one citizen, Kieran Maxwell, a 43 year old single mom who is about C$100,000 in debt primarily from student loans and credit cards. In 2017, she realized she couldn't even keep up with the minimum payments on her credit cards after using them to take care of her 14 year old son, who has learning disabilities. She flinches when her phone rings with an 800 number, fearing debt collectors. Due to low rates, the once financially sound country has found itself on a recent borrowing binge. The country's ratio of debt to disposable income rose to a record 174% in the fourth quarter, from 148% a decade earlier. Now, everyone is waiting to see what will happen next. The Bank of Canada has raised rates 5 times since 2017, resulting in current rates of 1.75%. Federal rules put into place have curbed speculation in the housing market. Home values are falling for the first time in three decades. In other words, the chickens could soon be coming home to roost. Individual households are also feeling the pain. For instance, the debt service ratio, which measures how much disposable income goes to principal and interest payments, was up to 14.9 in the forth quarter, nearly matching the 2007 record high. Delinquencies in auto loans hit 0.97 in the last quarter of 2018, which is the highest number since the aftermath of the 2008 recession. Data is also showing a "pronounced shift" to leasing, as higher rates make it less economical to offer cheap longer term loans. Leases made up 36% of the C$7.85 billion in new auto loans in the fourth quarter, the largest share since before the financial crisis. These loan delinquencies could mean that further trouble for housing is on the way. In Canada, borrowing from home equity lines of credit, or Helocs, is also growing "faster than residential mortgages". In other words, more people are tapping the equity on their already existing homes than are taking on new mortgages. Helocs totaled C$243 billion in October, or 11.3 percent of total household debt. Heloc balances, per capita, in Canada were $4,849 in October, more than quadruple the $1,080 in the U.S., according to Bloomberg. The article also notes that a total of 31,900 Canadians filed for insolvency in the three months through December, the most since 2010. 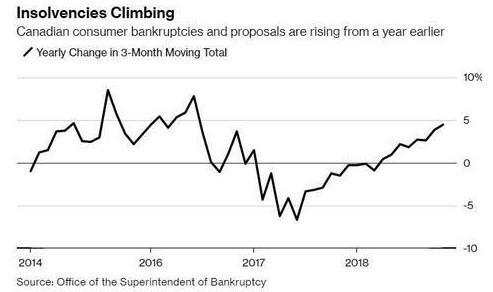 We have been watching Canadian bankruptcies closely. Earlier this month we reported about how soaring insolvencies were crippling local banks. This news came just weeks after we reported that insolvency filings had skyrocketed in almost all Canadian provinces. Toronto-Dominion Bank and Canadian Imperial Bank of Canada both posted ugly first quarter results that included higher provisions for loan losses as a key contributor to missing analyst expectations. TD Bank saw its provision for loan losses move to C$850 million, which was up 23% from the year prior. It also marked the highest level for such provisions in at least two years, mainly split between the bank's U.S. and Canadian retail divisions (36% each), followed by the bank's corporate division. CIBC also saw its provisions rise - more than doubling across the bank to C$338 million, which also marked the highest level in at least two years.